After the Saviour was born of the Virgin and circumcised on the eighth day according to the law, then, as Luke the evangelist says, “when the days of their purification according to the law of Moses were accomplished, they brought him to Jerusalem to present him to the Lord, as it is written in the law of the Lord” (Luke 2.22). He is circumcised according to the law, brought to Jerusalem according to the law, presented to the Lord as it is written in the law and a sacrifice is offered as the law demands. Notice that the Creator and Lord of the law is completely obedient to the law. What does He achieve by this? He makes our nature obedient in all things to the Father, He completely heals us of its disobedience and transforms the curse on it into a blessing. As all human nature was in Adam, so it is in Christ. All who received their being from the earthly Adam have returned to the earth and been brought down, alas, to Hades. But, according to the Apostle, through the heavenly Adam we have all been called up to heaven and made worthy of its glory and grace. Secretly for the present, for it says “your life is hid with Christ in God”. But, “when Christ shall appear”, at His second manifestation and coming, “then shall ye all appear with him in glory” (Colossians 3.3). What does it mean by “all”? All those who have received the adoption of sons in Christ by the Spirit, and have proved by their deeds that they are His spiritual children. 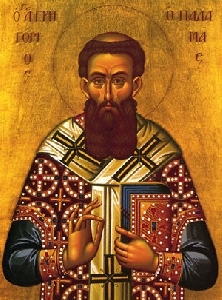 Source: Saint Gregory Palamas, from a sermon given on the Feast of the Meeting of the Lord, in one of the years from 1347 to 1359, in Thessaloniki.